We found our tribe of Seahawks fans (12s!) at a neat sports bar in Kailua-Kona! If you’re a big football fan who’s traveling to Hawaii during NFL season, you might reach a point during your trip planning where you wonder … Where am I gonna watch the football game on Sunday? 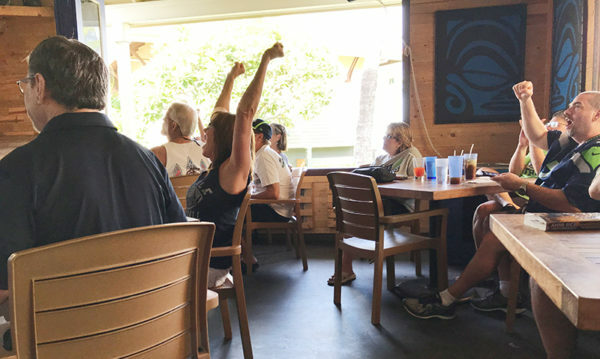 My wife and I have been to different Hawaiian islands probably 2-3 times during NFL season, and each time we’ve managed to find some good places that open up early Sunday for tourists to catch their favorite team’s game. Our most recent trip was last month when we visited the Big Island (Hawaii) with friends. But we were the only ones who wanted to find a place to watch NFL games — preferably with other Seattle Seahawks fans! — so the planning was all on our own. 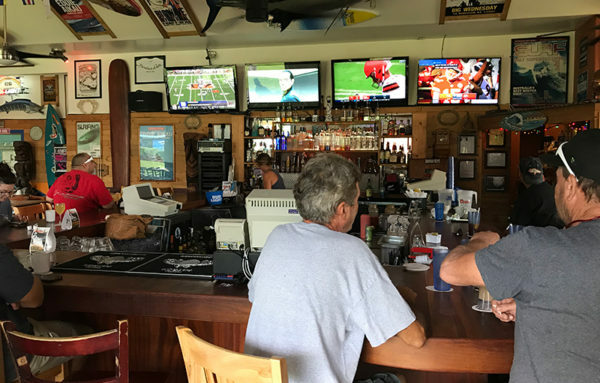 Good news: There are three sports bars nestled closely together in Kailua-Kona and each one opens early on Sunday mornings for NFL fans! 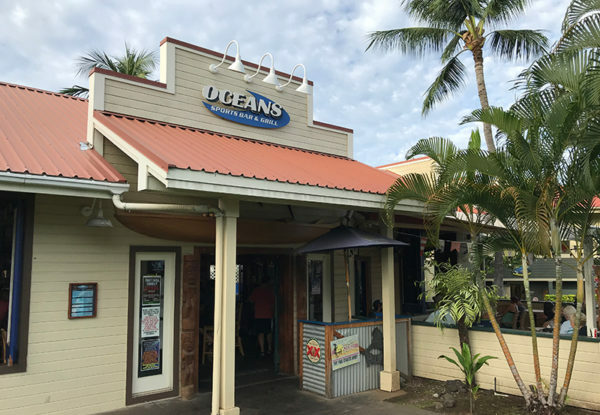 My wife and I ended up at Oceans Sports Bar, which is just off Ali’i Road, the street that runs along the coast. As we were walking there, we passed by two other sports bars that were also open early and had TVs on for people to watch the games — Bongo Ben’s and Laverne’s. There are a few other bar/restaurant-type places in that same area that may have also been open, but we didn’t walk to them. Oceans has a pretty big bar area with a bunch of TVs above showing the games, and then several more TVs placed throughout the dining areas. My wife and I arrived just as the game began and picked a table in the first dining area, where about 10-15 Seahawks fans had already gathered. It’s always fun to watch a game with other 12s, and this was no exception. The crowd grew as the game went along, and there were eventually about 25-30 Seahawks fans spread across two dining areas. There were also some Broncos fans, Chiefs fans and a few other teams represented … but Oceans Sports Bar seems to be the place for Seahawks fans to gather. Service was excellent. Our waitress was quick to bring my wife a mimosa and kept me filled with various tropical juices all morning. 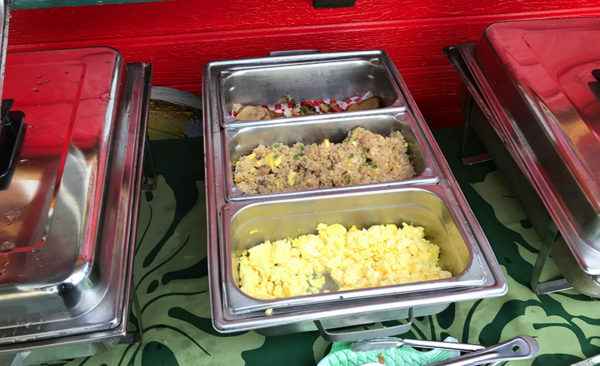 For breakfast, they offer a buffet that runs $14 per person, as I recall, which is pretty much a bargain for Hawaii. It was fairly standard stuff — scrambled eggs, bacon, home fried potatoes (to die for! OMG), biscuits and gravy, fried rice and some fresh fruit options. I think they had the fixins for a loco moco, too. As part of the buffet, you can also order a Belgian waffle — it looked delicious, but we were too full to try it. All in all, we had a great morning. The food was good. The service was good. The atmosphere was really fun. And we got to watch the Seahawks beat Detroit alongside a big group of fellow football fans. 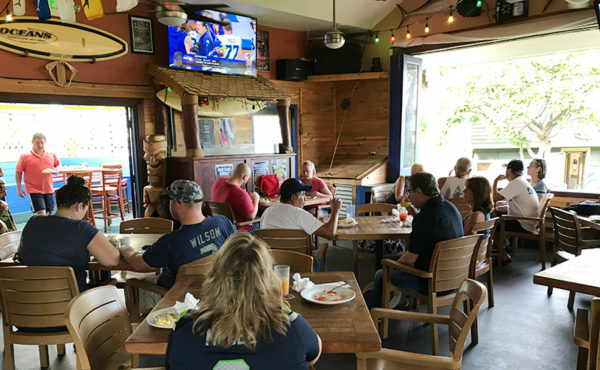 If you’re an NFL fan looking to watch the games on Hawaii’s Big Island, you can’t go wrong with Oceans Sports Bar — especially if you’re a Seahawks fan!